Your Next Stamp Fun Friday Challenge #109-Patterned Paper! Hello! It's time for a new Fun Friday Challenge at Your Next Stamp and this time the challenge is to use Patterned Paper on your creation! 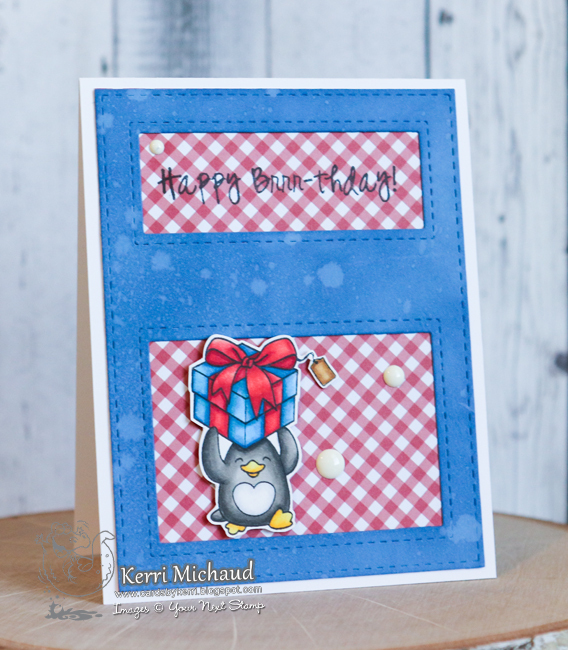 For my card I used the super cute Waddles-Snow Fun Stamp Set. I stamped my darling image with Black Olive Ink and colored with Copics. For the background I used the Window Panel Die to cut a piece of blue cs, and then I sponged over it with Salty Ocean Distress Oxide Ink and spritzed with water. I layered a piece of dp from the Mint Cocoa Kisses 6x6 Paper Pad behind the panel and then stamped my sentiment onto the dp. I popped up my image with foam tape and then added some White Sugar and Sparkle Gumdrops to complete!